The unearthly beauty of stained glass lies in its ability to yield colored light. The depths of colour captivate the mind with their luminescent intensity. Stained glass is a surface to look both “through” and “at,” bringing a paradoxical dimension to each panel; we can, in a sense, see through to another world. 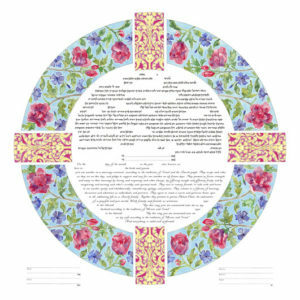 This ketubah design is based on traditional rose window stained glass architecture found in historic sanctuaries. 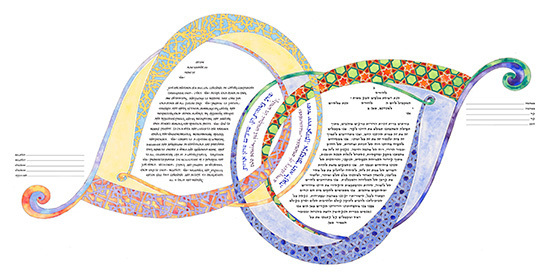 The central panel, the circle and star, is an abstract kaleidoscope shape with a Mogen David centerpoint. Its sunburst expansion invites one to contemplate the essence of growth. 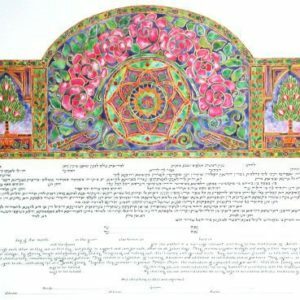 In a canopy above the central panel wild roses intertwine in the living symbol of a chuppah. Two peacocks support the base of the vine, symbols of the soul of bride and groom. 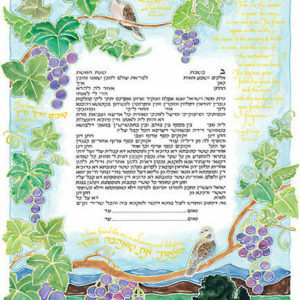 Adorning the supporting panels, two trees of life stand as testimony to the fruitful outcome of this happy covenant. 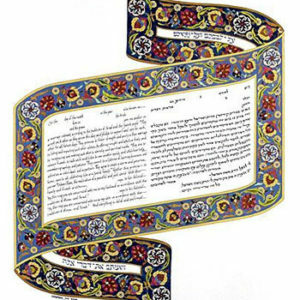 Limited Edition Illuminated Hebrew Manuscript Lithograph. 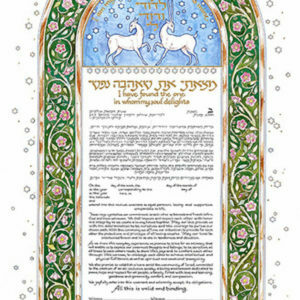 Innocence, tenderness and healing energy are conveyed in this romantic miniature composition. 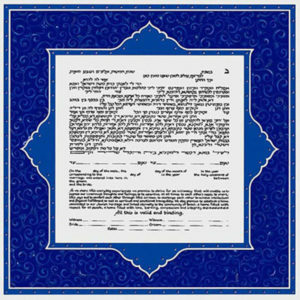 The traditional Chuppah canopy symbolizes the hospitality of the Jewish home of the betrothed and serves as a sacred, protected arch where ritual vows are undertaken in the presence of the Divine. 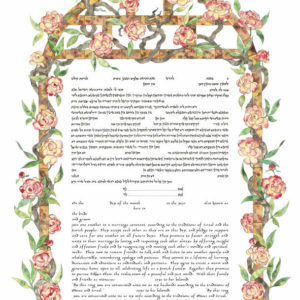 Blushed Paeonia flowers adorn this open Chuppah composition. Commonly known as “Peony”, this flower is among the longest-used flowers in ornamental culture around the world and is known as “Flower of riches and honor”. 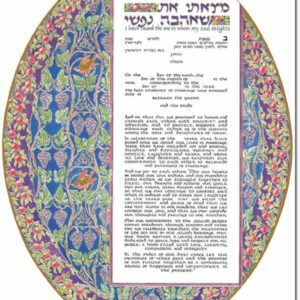 The Passages ketubah strikes the viewer with its regality and composure. 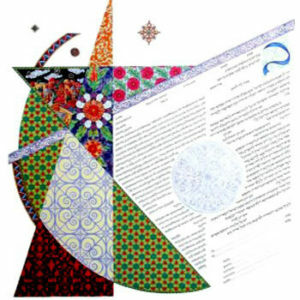 It is a design honoring the majesty of the wedding ritual and the important life transition for bride and groom, their families and friends. 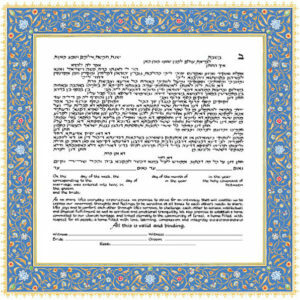 The lavender band suggest the tallis or chuppah, a holy covering for their ceremonial vows. 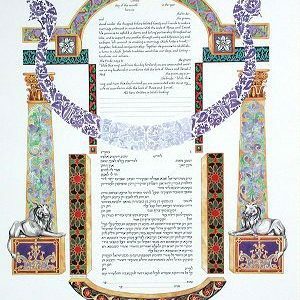 The pillars are a traditional symbol of support and knowledge, and seated at the foot of them are the lions of Judea, the guardians of Jewish faith. A sense of mystery and thoughtful reflection develop within this work.